The Caribbean's carnivals have several common themes, many originating from Trinidad and Tobago Carnival , based on folklore, culture, religion, and tradition (thus relating to the European use of the word, not amusement rides, as the word "carnival" is often used to mean in American English. Carnival tradition is based on a number of disciplines including: "Playing Mas"/masquerade; calypso music and crowning a Calypso King or Monarch; Panorama (steel band competition); J'ouvert morning; and a number of other traditions. Approximate dates are given for the concluding festivities. Carnival season may last for over a month prior to the concluding festivities, and the exact dates vary from year to year. "Caribe-Expo" — In the city of Ottawa in Ontario, Canada. "Carifiesta" — In the city of Montreal in Quebec, Canada, typically 2–3 weeks before Toronto's Caribana. "Scotiabank Caribbean Carnival Toronto" — In Toronto, Ontario, it draws close to a million visitors to the city. Formerly "Caribana". "Carnival"(cancelled) — In the city of Hamilton, 1 week after Toronto's Caribana. "Carifest" — In the city of Edmonton in Alberta, Canada. "Cariwest" — Held annually the second week of August in Edmonton, Alberta, Canada, Cariwest boasts an amazing display of masqueraders in the main parade, and is a beautiful festival full of food and entertainment in the heart of downtown. Barrie's Caribfest (parade has been cancelled since 2011) is Canada’s second largest Caribbean festival. It is held on the shores of Lake Simcoe in the beautiful city of Barrie. However, the activities extend throughout downtown Barrie as the costume bands wind through downtown streets, along Lakeshore Drive to Centennial Park, the location of the main stage. This dynamic, exciting event features some of the best Canadian and international Caribbean performers in music, dance, costumes, and world drumming. A unique attraction distinguishing this Caribbean event is its location. This dynamic, exciting event features some of the best Canadian and international Caribbean performers in music, dance, costumes, and world drumming. Events are held from Friday to Sunday throughout every third weekend of August. The Grand Parade in Toronto is held on the first Saturday of August to commemorate the abolition of the slave trade on August 1st, 1838. Carnaval Antillais de Colombes — every year late June. Carnaval Tropical de Paris — every year early July. Rotterdam — "Summer Carnival" Zomercarnaval: occurs every year in July. Each year there are more than 800.000 visitors. 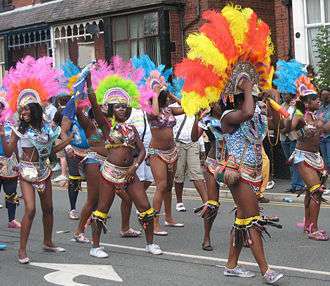 Leeds — Leeds West Indian Carnival, sometimes called Chapeltown Carnival; the oldest West Indian Carnival in Europe. Baltimore, Maryland — Baltimore Caribbean-American Festival held every July in Druid Hill Park neighborhood in Baltimore. Chicago, Illinois — Chicago CARIFETE, third Saturday in August, on the Midway Plaisance in the confines of the University of Chicago Campus. Miami Broward Caribbean Carnival  Miami, FL — the second weekend in October, Columbus Day weekend. Houston, Texas — usually the weekend around Fourth of July. Jersey City, New Jersey — the fourth Saturday of July from Lincoln Park (Jersey City) parade route leading to the Festival at Exchange Place. Los Angeles, California — Hollywood Carnival, Parade of the Bands, fourth weekend of June. New Orleans, Louisiana — in November, the bayou Bacchanal is held on the first Saturday in downtown and Armstrong Park. Orlando, Florida — usually held the last weekend in May, which is typically Memorial Day weekend. Most recently been held at the Citrus Bowl. Raleigh/Durham, North Carolina CaribMask  usually held on the third Saturday in August. Seattle, Washington — Pioneer Square, annual Fat Tuesday celebration. Tampa, Florida — usually held the beginning of June in St. Petersburg, Florida (Greater Tampa Bay Area) at Vinoy Park. Recently moved for 2011 to Raymond James Stadium. Washington, D.C. — DC Caribbean Festival, usually between June 16–24 every year. Worcester, Massachusetts — Worcester Caribbean American Carnival, The day after Boston, MA Carnival. Charleston Carifest, Charleston, South Carolina — third weekend in June (a week before DC Caribbean Festival). 1 2 "WIADRA westindian carnival organisation". Retrieved 17 June 2016. ↑ "List of Carnival and the world". Retrieved 17 June 2016. ↑ "A brief History of Carnival". Retrieved 17 June 2016. ↑ "Meaning of "carnival" in the English Dictionary". Retrieved 17 June 2016. ↑ "BVI August Festival". Bareboats BVI.